F This Movie! : Can a Song Save Your Life? I have always wanted to be a musician. My entire life, I have felt a draw to music and its ability to connect with you in a mere three minutes and 30 seconds. I took lessons in piano and guitar growing up, but none of the notes ever stuck to my fingertips. So I tried to write lyrics, but without the instrumentation, they never seemed to make sense. It was one of those examples of passion without talent. Unluckily for me, my brother can pick up any instrument and learn it within the hour. This only fueled our tense brother-sister relationship growing up. (He says he was always jealous of my “artistic” talent, which fueled his side of the feud. As with music, my artistic talent is questionable). We eventually grew up and this strain faded into an admiration for him and his craft. I believe this was part of why I love music in movies so much. Not just musicals, either (which I do also adore). I love movies based around musicians exploring their craft. How does a musician create a song? They are able to somehow, beyond my comprehension, put together the pieces of string, wood and words to create something tangible. That process is a mystery that I feel compelled to try and unravel. The one film that has come closest to helping me figuring this out is Begin Again, John Carney's second foray into the life of a musician following his previous film Once. With his second film, he brings his innate musical sense from the small scale of two aspiring musicians to the world of major recording labels. This film is very true to its title. It’s about learning to begin again through the creation of music. I myself have never had the ability to regenerate through creating music, but by listening TO and wrapping my wounds in music, I have been able to create an emotional cocoon. It’s the closest I have come to the musical process and what this film heavily explores. 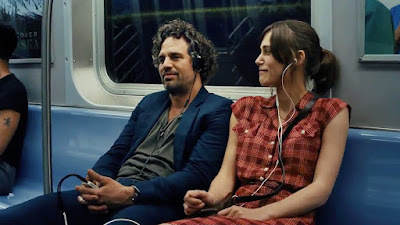 In Begin Again, the two main characters, Dan (Mark Ruffalo) and Gretta (Kiera Knightley), have reached absolute rock bottom. Dan was just ousted out of his position as the head of a record label due to his drinking and inability to accommodate a changing recording industry, as well as being on the outs with his wife and daughter. Gretta is freshly moved to the states with her rising rock star boyfriend, Dave (Adam Levine), has just been dumped and is alone in New York. Deciding to move back home to the UK in this heartbreak, her only compatriot, Steve (James Corden), encourages her to perform at an open mic night. 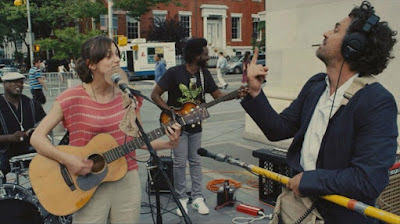 By chance, Dan happens to be in attendance at the very same open mic and is immediately inspired by Greta's stripped down acoustic performance. He likes her performance so much that he wants to produce for her (even though he has no budget). Dan hears something special in Greta's raw words that he feels he can polish to create a distinct and fresh sound. The story of the movie is how they work together toward this common goal. This film creates a world of dichotomies with both its characters and its visuals. Dan and Gretta are in the opposite ends of the creative process. Gretta says she writes songs only sometimes and for her cat; she has an uncorrupted talent that she hides away due to a spotlight on her ex-boyfriend and a lack of confidence. Dan has been beaten down by the industry and is hollow from his creative exhaustion. Their counterpoints create a funnel for their musical passion to be excised. This is shown through the split narrative intro and naturally created where the screen is split by objects in the line of sight. The split narrative of each of their backgrounds is necessary for us to understand how and why meeting at that open mic was life changing for them both. The natural splitscreen is best used when Dan and Gretta start a discussion about his daughter, Violet (Hailee Stainfield, who once again brings an endearingly salty teenage performance). Dan leaves the diner after a comment by Gretta about his parenting. We see Greta inside through a window and Dan, outside, throwing a small tantrum. These small camera tricks express the hurdles these characters face: Gretta trying to gain confidence in her abilities and Dan gaining confidence again. They do it together and they battle their own strong personalities to get to that middle ground. This is also where I tell you that if you don’t like singer-songwriters or montages, this film may not work for you. Begin Again can be seen as a series of music videos held together by a narrative. I really respond to this aesthetic. Dan and Gretta decide to create a music project using the city as a their recording studio due to financial restrictions. Watching them create this album on the streets of New York city really pops and makes a West Coast native like me want to run around the city listening to my iPod. The music they create together also leans on the singer-songwriter, which resonates as the raw passion project of these two people. Knightley actually sings, too, which is even more impressive as she sings her romantic lullabies into the microphone. The theme song of the film, “Lost Stars,” is explicitly poignant and is haunted with Gretta’s life experience. The relationship between the two leads is also interesting due to the fact that it rides the line of romance but never tips it. Mark Ruffalo and Keira Knightley have a wonderful chemistry with each other. A film that wanted an easy resolution would have made them fall in love with each other. Instead, they allow their chemistry to manifest in the music. In the end, Ruffalo gets back together with his estranged wife Miriam (Catherine Keener). It feels natural for them to have this ending and for Dan and Gretta to continue to work together in a professional manner rather than a romantic one. Their friendship and professional relationship creates that balance that is so key to great music. These artists are both talented and competent on their own, but finding someone who takes your work to the next level is its own kind of intimacy. Sometimes the most basic ideas are the hardest ones to explain. The original title of the film was Can a Song Change Your Life? 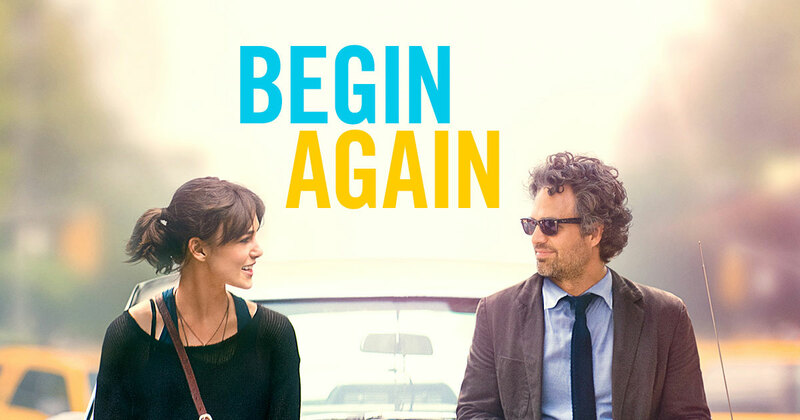 I think the title Begin Again is simpler way of getting at this idea. Creating music helped these characters begin again through talent, heartbreak and ingenuity. The connection with other suffering artists to gain resolution of life experience is marked in the music and lyrics and shows that’s how you create a soundtrack to someone’s reality. Really enjoyed reading this. It's a well-thought out look at a movie that I think is a bit underappreciated. I've never had any aspirations of being a great musician aside from wanting a drum kit for a long time as a kid (being the perfect combination of expensive and loud ensured I would never get one). I can play the bass at an amateurish level, but that's just for fun at home. Even that can feel pretty satisfying though when I find myself competently playing along with a song. Also, I understand the allure of being a musician partly through my dad's stories about being in a band as a teenager. 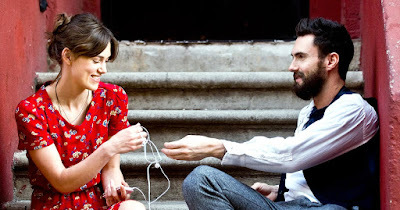 Some people criticize John Carney for making the same movie repeatedly but it's a kind of movie that connects with me and that we aren't really getting from anyone else. Even among fans of Carney's work Begin Again is largely considered to be lesser Carney. There's plenty in it I enjoy though and while it's not as good as Once it's easier for me to revisit more often. Glad to hear you enjoyed this movie after all. 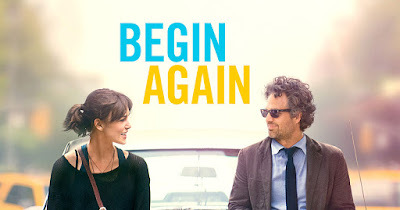 I recall a past podcast or review where you described Begin Again as something along the lines of "a more commercialized version of Once with less soul" (perhaps I've twisted those words in my mind). I really liked the movie as well, it's very comfortable and even though my music taste is the opposite of "understated", I really had the urge to get the soundtrack after watching it. In fact, I'll look it up on Spotify right now.